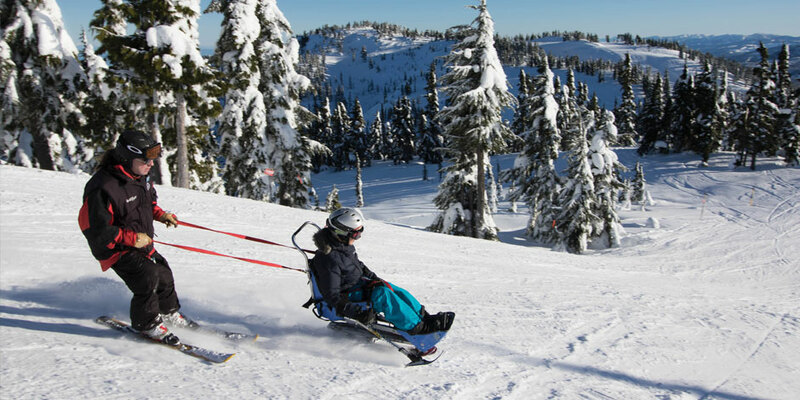 Vancouver Island Society for Adaptive Snowsports strives to make the joy of skiing and snowboarding accessible to all. Many people who live with disabilities are more able to ski or snowboard than one might think. At Vancouver Island Society for Adaptive Snowsports (VISAS) we know that there are many, many people with disabilities who can safely navigate descending a hill on skis or snowboards. VISAS is a group of volunteer, nationally certified ski and snowboard instructors who help people living with disabilities to do just that. If you’re a person with a disability and want to ski or board (and you don’t feel comfortable seeking out instruction through the ski school at Mount Washington), you can come to us, and we’ll figure out a way for you to join the fun. All of our students come with their own unique mix of abilities; jerry-rigging some kind of solution is always part of the journey. Generally, our students fall into four different groups of learners: those who live with visual impairments, unique cognitive needs, balance and mobility concerns, and amputation. I should hasten to add that, in addition to our alpine snow sports pursuits, we have many students who come to us to for adaptive nordic skiing, too. The role of gravity is present in Nordic skiing only half of the time and still, we find ways to help our nordic students solve that oh-so-important question of how to have fun safely. For many of our students, this is one of the only ways they can engage “on par” with their able-bodied friends and family. Being able to engage with others in a sporting way is one of the foundations of true community. At VISAS, we build community in abundance. For more information about VISAS and its programs, as well as learning or volunteering opportunities, please visit visasweb.ca.